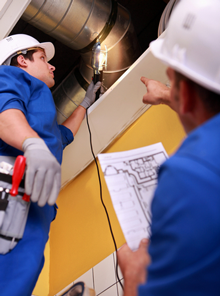 Install an effective ventilation system that will remove CO from work areas. Maintain equipment and appliances (e.g., water heaters, space heaters, cooking ranges) that can produce CO in good working order to promote their safe operation and to reduce CO formation. Consider switching from gasoline-powered equipment to equipment powered by electricity, batteries, or compressed air if it can be used safely. Prohibit the use of gasoline-powered engines or tools in poorly ventilated areas Provide personal CO monitors with audible alarms if potential exposure to CO exists. Test air regularly in areas where CO may be present, including confined spaces. See Title 29 of the Code of Federal Regulations (CFR) 1910.146. Install CO monitors with audible alarms. Use respirators with appropriate canisters for short periods under certain circumstances where CO levels are not exceedingly high. In addition, if your employees are working in confined spaces where the presence of CO is suspected, you must ensure that workers test for oxygen sufficiency before entering. This above is an excerpt from the article “Carbon Monoxide Poisoning.” For more info, please visit www.osha.gov.